TidalWave HMX MSD | Products | Headhunter Inc.
TIDALWAVE HMX® are U.S. Coast Guard certified Type II Marine Sanitation Devices (MSDs) in accordance with 33CFR Part 159. These systems are recommended for US Flagged vessels over 65 feet long. Standard models are available to treat up to 50,000 US Gallons per day (189 cubic meters per day). 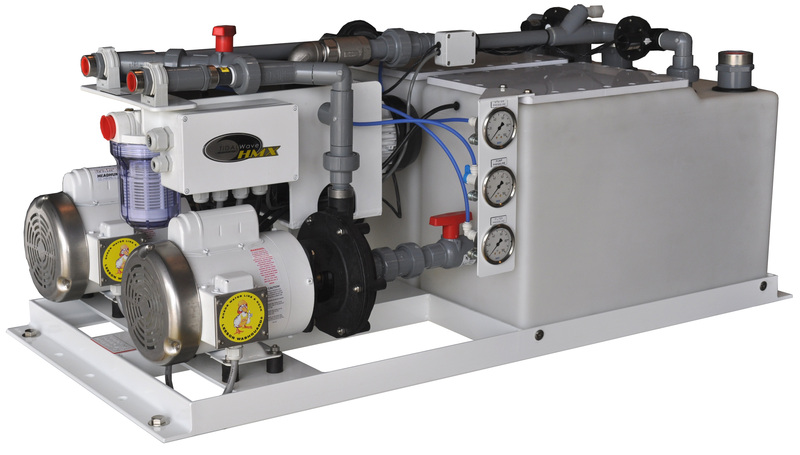 These systems provide automated state of the art processing of onboard sewage. Designed for quick starts and stops with the push of a button, the TIDALWAVE HMX® system uses chemical oxidation, hydro-maceration and patented cross-flow separation techniques to thoroughly destroy influent biomass. The optional AutoClor® Electrolytic chlorine generator system generates sodium hypochlorite on location from seawater or brine, thus eliminating consumables during operation. The four-stage treatment system provides trouble free treatment of black and gray water with a sterile effluent for disposal. These systems are provided in marine grade aluminum or steel construction with a high solids loaded epoxy coating for superior corrosion protection.